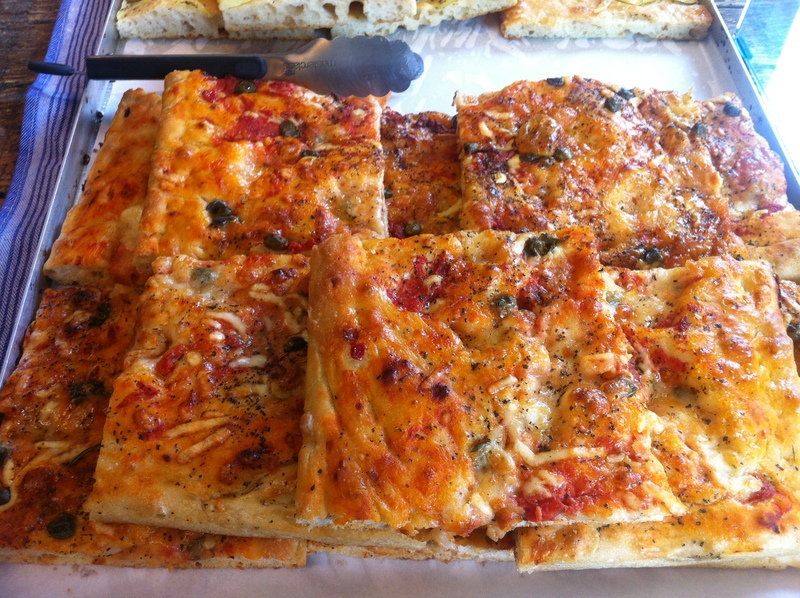 I thought I knew what focaccia was; indeed, I make it sometimes, using a Carluccio recipe. What I didn’t realise was that there are variations. I’d sometimes been served focaccia which seemed to me more like a pizza bianco – a pizza with no tomato sauce base – and thought, ‘That’s not focaccia.’ But actually, it was, or a variation of. 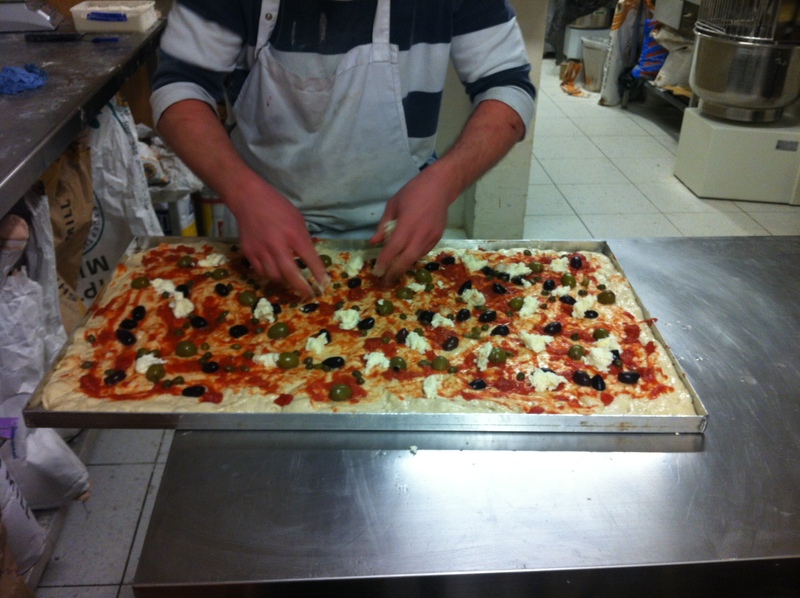 It was the kind of thin, pizza-like focaccia made more commonly in Tuscany. I thought of ‘real’ focaccia as the thicker bread with a soft interior that one pulls apart and dips into olive oil; the kind I make and have found often in London Italian restaurants. But when Italian friend Antonio asked me, after reading my post on Princi a few days ago, whether they had ‘real focaccia ligure’, I decided I needed to find out more. 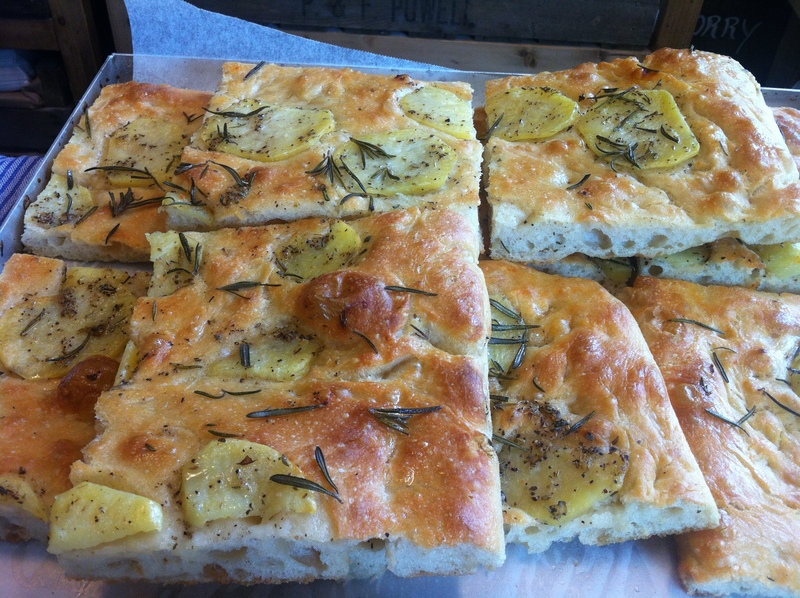 What was focaccia ligure? 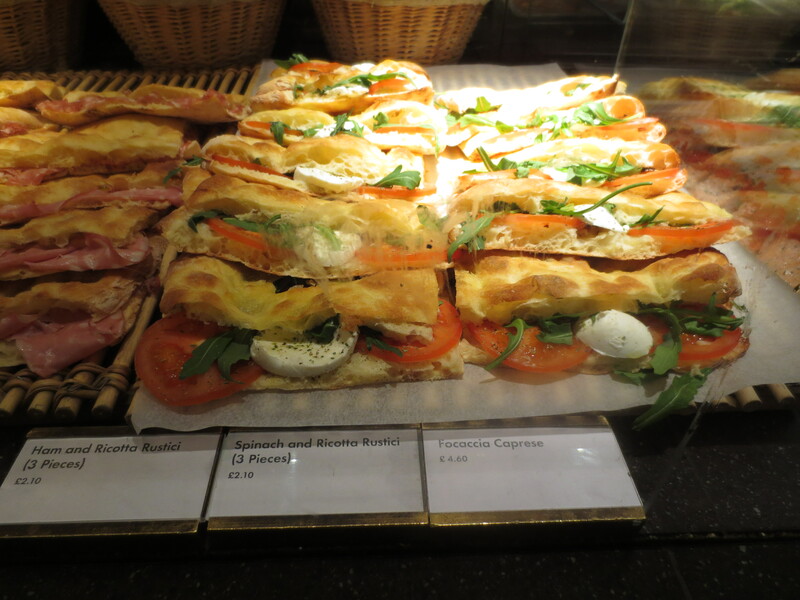 Was Princi’s focaccia, which they’d filled like sandwiches, ‘focaccia ligure’? Like the rest of the computer-using world, I turned to Google and searched ‘focaccia ligure’. I discovered this was where focaccia originated – i.e. in Liguria, in northern Italy. Thus is made sense that focaccia made in the Ligurian way would be The Real Thing. When I went into the wonderful local Italian bakery, Ruben’s Bakehouse, yesterday morning to buy bread and have a coffee, they were making pizza, ready to sell by the slice – pizza al taglio – at lunchtime. I knew they also sold focaccia. Did they sell focaccia ligure? I asked Milana. Yes, she assured me, and told me of the variations: the thin focaccia in the northeast, the thicker focaccia further south. So, I decided to go back today and buy both some of their pizza and some focaccia to take to my son’s at lunchtime as he was working from home. 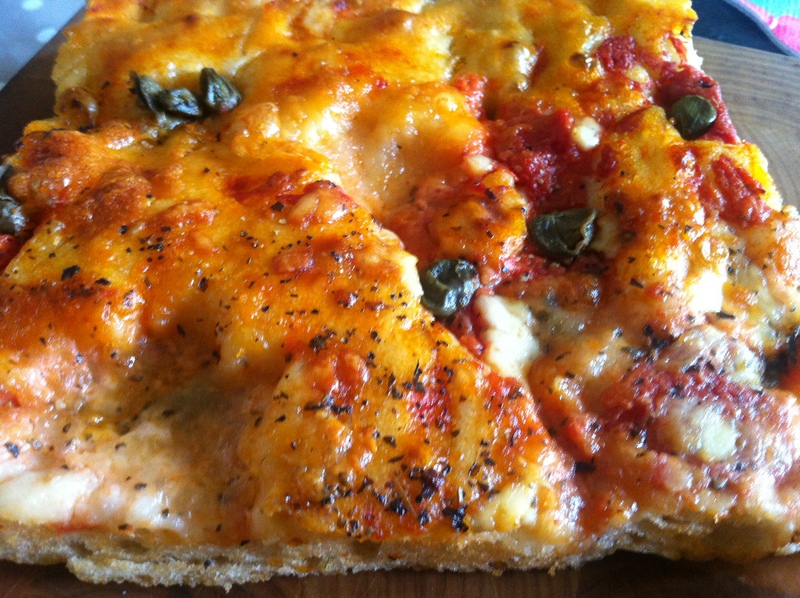 Focaccia ligure is quite thin, but not crispy thin. It’s brushed with good olive oil and usually some coarse salt and rosemary is scattered over the top. The brushing with the oil gives the bread a crisp exterior to the soft interior. But different regions have their own versions. In Recco, near Genoa, the bread is traditionally filled with cheese. In some places it is topped with tomatoes and olives; in others with potato slices. By the time I returned to Ruben’s at lunchtime – having popped in earlier in the morning to check they were baking pizza today – gorgeous, inviting large slices of both pizza – topped with cheese, tomato and olives – and focaccia – topped with garlic, rosemary and potato slices – where calling to me from the countertop. I had to have both. Jonathan had some hot soup ready and we ate the pizza and focaccia with it. 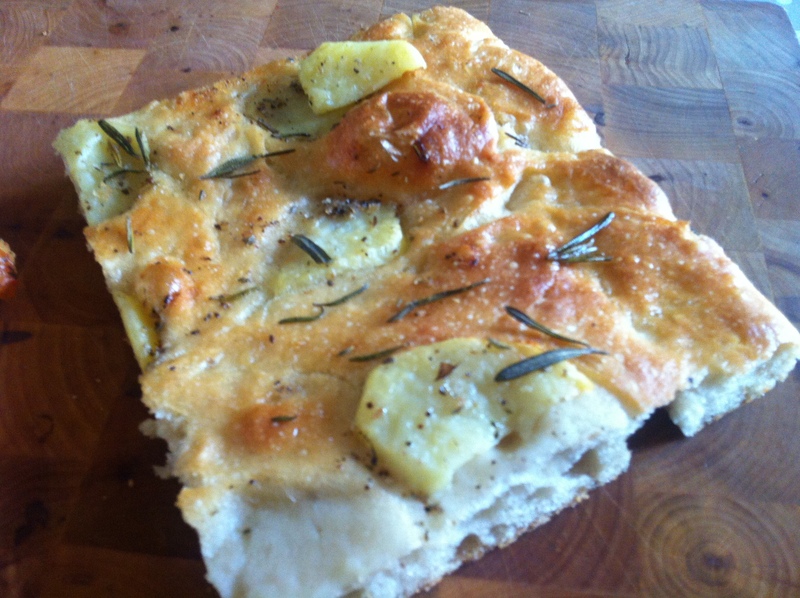 The focaccia with its strong, but not overpowering rosemary flavour and thin slices of potato. They both tasted WONDERFUL. How can something so simple taste so good? Jonathan and I discussed our love of bread. Not that awful spongy supermarket stuff packed full of additives, but the wonderful REAL bread that’s found at Ruben’s and other good bakeries, or restaurants like the lovely A Cena that makes brilliant focaccia too. I know with Ruben’s just a 5-minute walk down the road, I’m going to be heading down there at lunchtimes quite often to buy a slice of pizza or focaccia. How lucky am I to have this right on my doorstep! We usually make the thicker kind but now I’ll have to try this as well. Looks amazing. I usually make the thicker kind too but this was so good I’ll have to experiment … though just going down the road to Ruben’s is going to be very tempting! Oh do these look great…I especially like the thin potato and rosemary topping. They were excellent, Karen, and I think I’m going to be popping down the road quite often to buy more. Just bought a slice of pizza as I walked home for lunch. Ruben’s is packed out on a Saturday morning and such a fun place to be as well as selling wonderful bread and pastries and, of course, pizza and focaccia! I can see I’ll take up semi-residence. If you come to London, I will take you there!